A liking for the country; such would appear to be the situation for Japan’s Minami Ando. 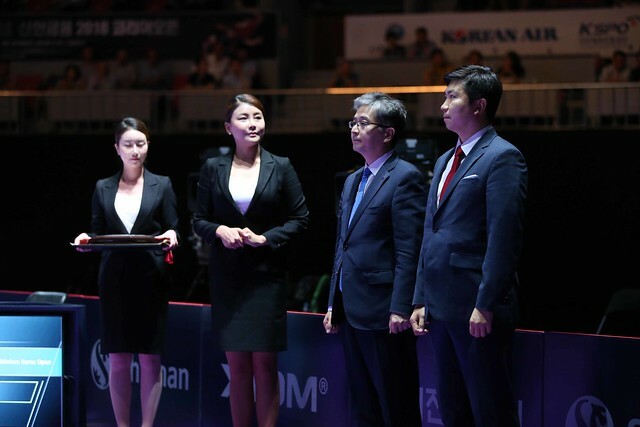 One year ago when the tournament was staged in Incheon, she won the Under 21 Women’s Singles title; now on Wednesday 18th July in the preliminary round of the Women’s Singles qualification event prior to the Seamaster 2018 ITTF World Tour Platinum Shinhan Korea Open, she caused a major upset. She beat China’s Feng Yalan (11-9, 9-11, 11-9, 9-11, 11-9, 7-11, 11-8). According to the current Women’s World Rankings, the outcome was as anticipated , Minami Ando is named at no.74, Feng Yalan stands at no.189; however, I would suggest that if Fang Yalan was subject to more international exposure, she would be somewhat higher up the batting order. Crowned World Junior champion in Cairo in 2006, later she won ITTF World Tour Women’s Singles titles in Berlin in 2010, before succeeding in 2012 in both Kuwait and Ekaterinburg; the win in the German capital city was one of note. She beat colleague Ding Ning in the final, having the previous day secured the Under 21 Women’s Singles title at the expense of Wu Yang, also from China. It is a record with which Minami Ando cannot compare. Equally, there was success for China’s Hu Lumei, her current world ranking of no.311 belies her status, in 2014 she won on the ITTF World Tour in Qatar; in Daejeon she used her defensive skills to good effect to beat DPR Korea’s Cha Hyo Sim, named at no.112. Success contrary to current status in the Women’s Singles preliminary round for Hu Limei, it was the same for colleague Li Jiayi and Korea Republic’s Choi Hyojoo, as it was for the DPR Korea pairing of Kim Song I and Kim Sol Song. World ranked no.204, Li Jiayi beat Portugal’s Shao Jieni, named at no.161 (11-5, 11-4, 11-8, 11-6); similarly Choi Hyojoo who stands at no.73, ended the hopes of Singapore’s Zeng Jian, presently owning the no.60 spot (8-11, 11-9, 16-14, 11-6, 11-9). Meanwhile, not to be upstaged, Kim Song I accounted for Hong Kong’s Minnie Soo Wai Yam (11-5, 11-5, 11-2, 11-9); Kim Sol Song overcame Korea Republic’s Lee Zion (11-5, 11-7, 11-6, 3-11, 7-11, 5-11, 11-9). The main event commences on Thursday 19th July.